A friend of mine recently sent me this news clip (CBS NEWS) about Vietnam in 1970; the year I was there. It's interesting footage actually showing a platoon on a combat patrol. The striking thing to me is the fact that the platoon - Alpha Troop 1- was operating near the Cambodian border somewhere between February (this month 47 years ago) and March of 1970. The footage really took me back to those dark days. You get a very intimate look at what it was like on patrols, and you'll witness an ambush. In late May, I was part of a combined force of Americans and South Vietnamese that crossed the Cambodian border in search of enemy headquarters. 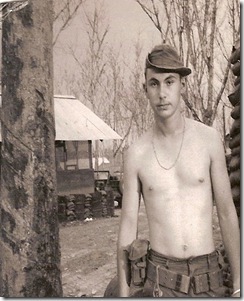 I lost my best friend in an ambush in Cambodia in similar circumstances. Instead of patrolling, we were carrying out arms and food from an underground bunker when a lone sniper lit us up! That sniper also got away. In closing I want to share one more film from 1970 in Vietnam. Probably the most ironic documentary you've ever seen. It's a great look at my world there (I was attached to the 9th Cavalry Division during that time (photo above) this was filmed prior to going into Cambodia). I was a rebellious 19-year old who just wanted to go home.